I wouldn't be exaggerating if I said we have a train obsession going on over at our house. We have a train table packed with wooden tracks and tiny wooden trains (Ikea has very well-priced tracks and trains, if you're on a budget but want to get in on the train madness). Whenever we're on the road, Master W. is constantly scanning the scenery for trains, train bridges, railroad tracks and "jingle bells" (a.k.a. crossing lights and gates). And Miss C. loves to reconfigure our wooden train tracks over and over again. 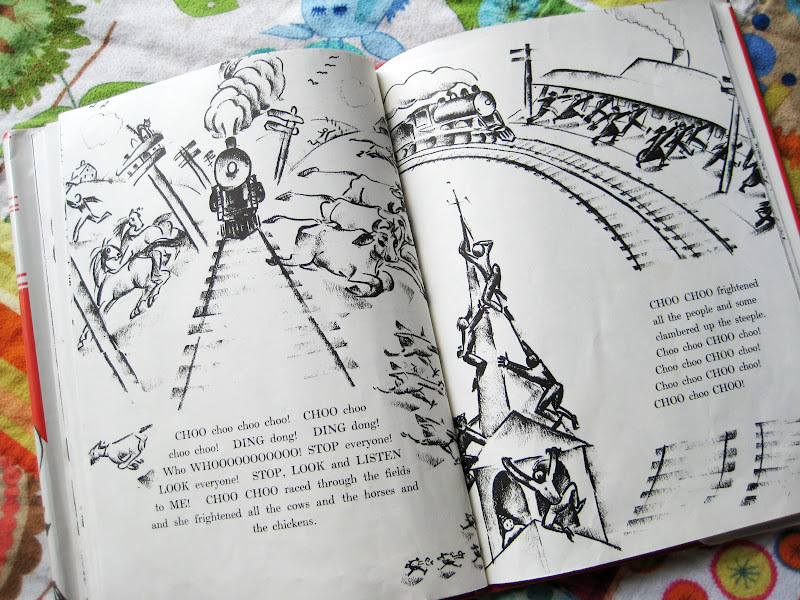 You can imagine, then, how thrilled we are whenever we score a great train book at the library. One of our favorites this summer was 'Choo Choo: The Story of a Little Engine that Ran Away' by Virginia Lee Burton (yes, this is the same author who wrote the classic 'Mike Mulligan and His Steam Shovel'). 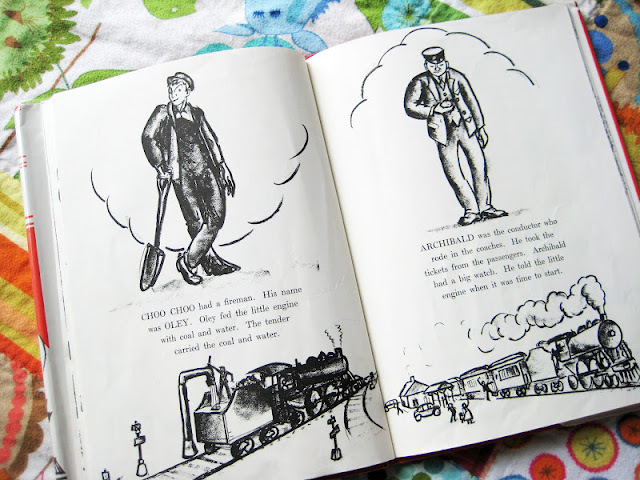 Burton's is, of course, an amazing storyteller and illustrator and she put her gifts to good use when creating this story about a naughty little engine. The story begins by introducing Choo Choo, a little black engine, and her crew: Jim the engineer, Oley the fireman and Archibald the conductor. 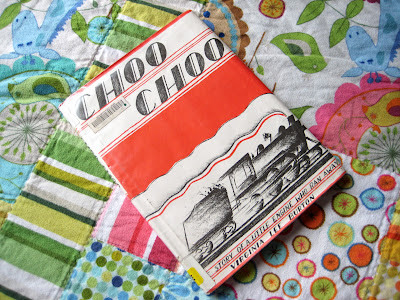 All is well until one day Choo Choo decides that life would be so much more fun if she no longer had to pull all of the cars full of passengers and mail and luggage. She makes a bold escape while Jim, Oley and Achibald are enjoying a coffee break and chaos ensues! 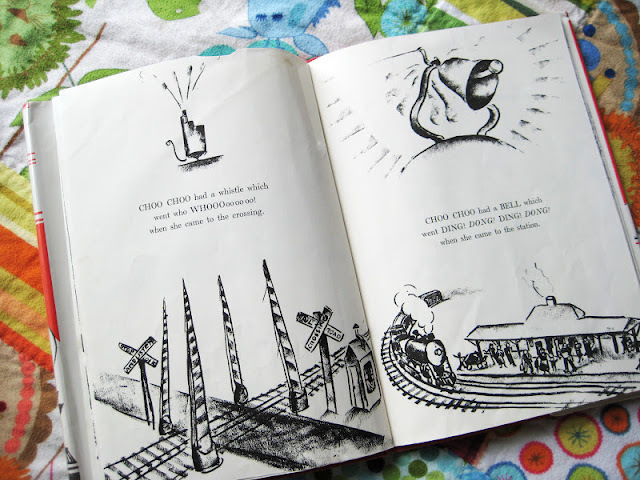 We read this one over and over again until my kids practically had the story memorized. And even though we returned it weeks ago, Master W.'s little wooden engine that lives on our train table still manages to lose her tender on a regular basis - just like Choo Choo does in the story. 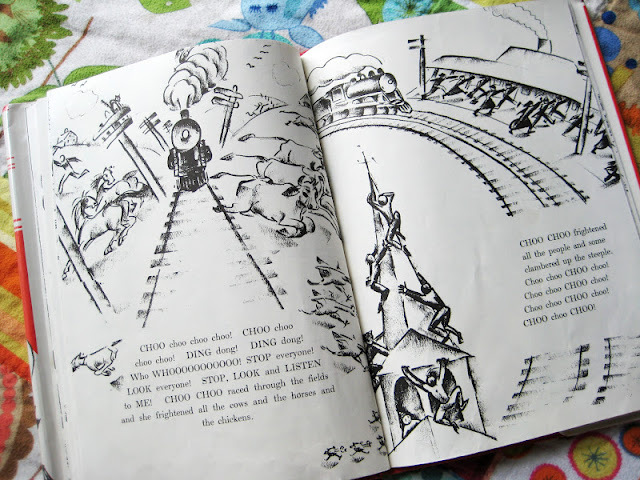 Of course, you'll have to read the book to find out what happens to little Choo Choo. 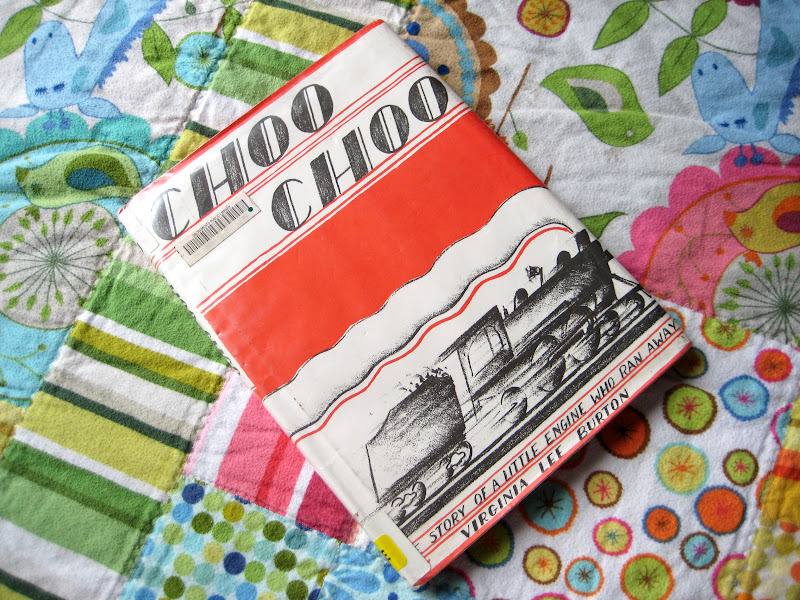 I promise you, though, that you and your little train lovers won't be disappointed – Choo Choo goes on quite an adventure! 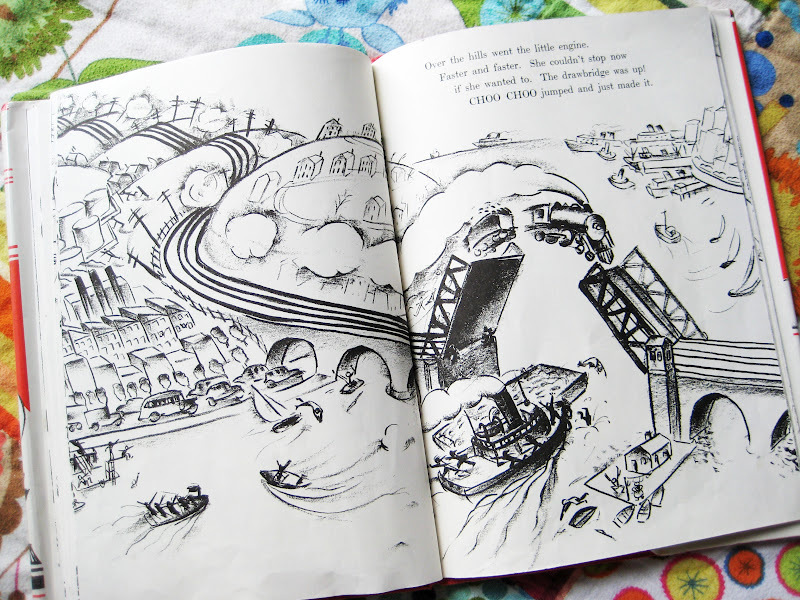 The author did an amazing job with the illustrations. They really do bring the story to life! Ooooooooh --- this is BEAUTIFUL!!! I love art like this. What an amazing find! This was one of those books that I just randomly pulled out of the library stacks... and it turned out to be a complete gem. 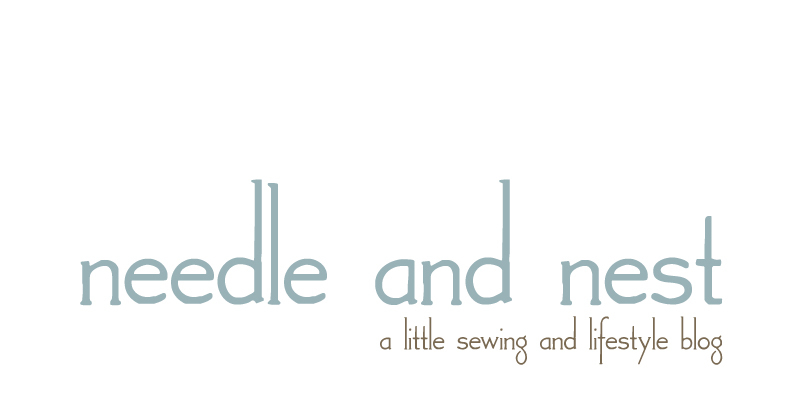 We're definitely going to have to check it out again! A little gift for my mom.